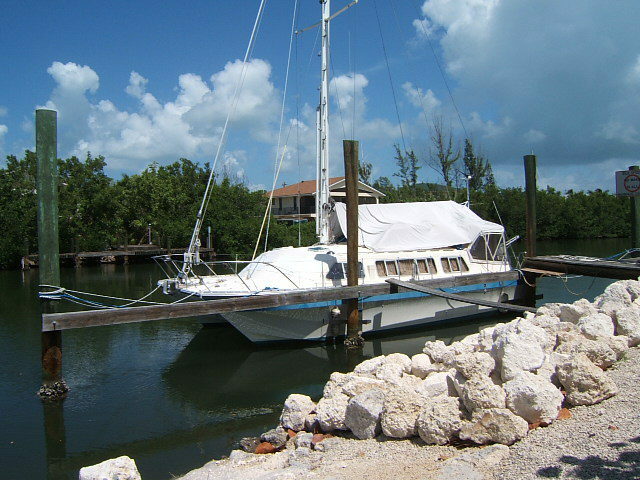 arning of 2004. and now have 3 major trips on her totaling nearly 4000 nautical miles, as well as numerable short trips. 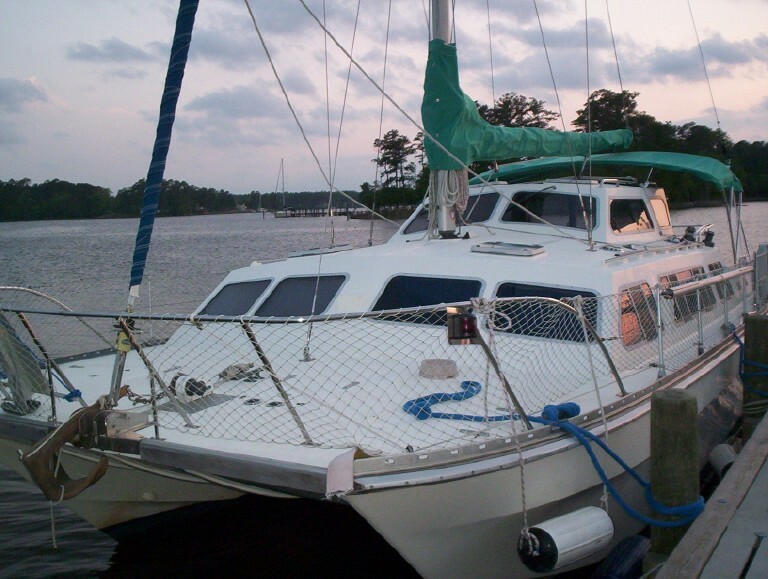 This review is based on our experience with her From the fall of 04 through the spring of 07 we were recovering from hurricane Ivan (Aug 04) in Pensacola, or in Oriental , NC or Green Cove Springs (near Jacksonville) working on solving the problems of a neglected 30 year old vessel and upgrading it with new or modern equipment. We spent a bit more money and a lot more time than we had hoped and ended up with far better boat than we dreamed of.. In 2005 we moved her 500 NM from Oriental to Green Cove Springs and in March 2007 we moved her another 600 NM to Port Everglades to ship her to Mallorca, Spain. From there we sailed and motored her nearly 2500 NM around the Med to NE Italy near Trieste. Since then we have have spent 3 months each year aboard her enjoying our “home port” on the river Aussa or cruising the islands and waters of Croatia. We have now lived on her a total 22 months and traveled over 5000 NM. We have survived several nasty storms aboard her. She has spent 4 winters in the very north of the Adriatic. (About the latitude of Duluth , Mn.) She has been in the water all of the time except for 2 weeks last year when we did some routine maintenance and a bottom job. I'll focus on telling you the pros and cons of the boat as we use it, as opposed to advising readers on how to do any repairs or to describe our adventure in Europe or even to tell you how to get a boat to and from Europe. I will try to write some about those topics this fall. To us, our use puts several demands on a boat that are different than that of a day sailor or a vacation cruiser. Safety is job no 1..
arning. We also got caught on a lee shore at sea with a squall that lasted over 2 hours and indicated winds to 45 Knots. We had several hundred miles of fetch across the sea into to the northern coast of Africa so we developed seas of over 8 ft. We had no warning so we were caught under power without the ability to anchor.. Serendipity rode these out with aplomb. Very soft and stable ride. No drawers or cabinets opening. No dishes or other things thrown on the floors. No hobby horsing. No fears for either the first mate or myself. Consistent with what I expected. I have never heard of a Catalac 10 meter capsizing, although I have heard of one 9 meter boat going over head first (pitch poling) but it was running downwind under full sail and more of less out of control. I frankly think it was being a bit recklessly sailed. stay upright and on their feet in a storm, go into irons fairly easily, and stay there without a lot of attention. A sea anchor on a bridle holds them nicely into the wind if you have enough lee way. 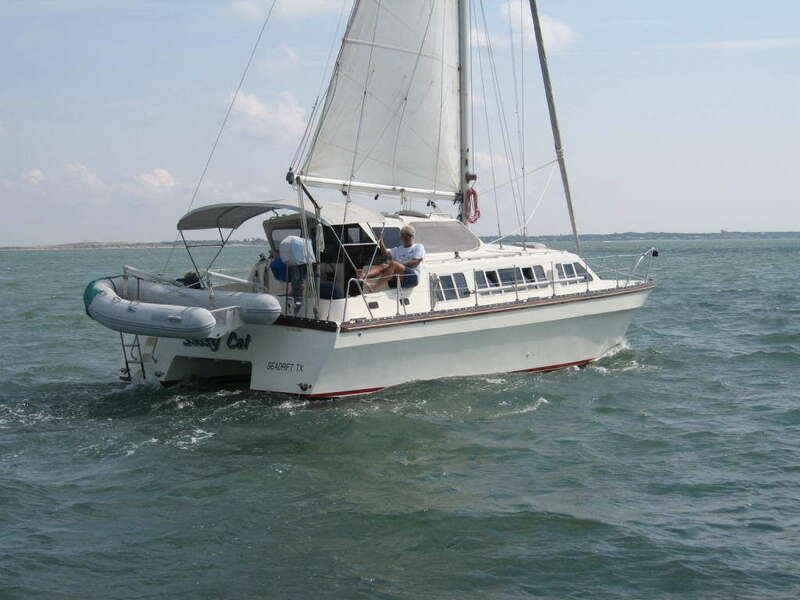 With twin 25Hp sail drives you have the power to work off a lee shore if you need to do that as well as the ability to push the bow into the wind. I have not had water over the bow. About the only thing I'm careful about is avoiding overloading the bow or the stern. There are 4 very large lockers at both ends which invite lots of stuff and overloading the ends. DO NOT DO THAT. These boats must be lept light on their 'ends'. But there is more to safety than a stable design. One reviewer said “they are built like a battleship”. While that may not true if taken literally, they do have a lot of very dense fiberglass everywhere. This makes for a stiff hull with a nice margin of strength to stand up to groundings or collisions with the stuff, now and then, one finds in the water. This strength and stability, and a well protected helm station helped me stand extended watches without being exhausted. So when the time came for alert and decisive action I was able to deliver. The rudder is hung on a stout keg protecting the sail drive and the prop. what is in it. The is great storage in each head for the things that logically go with the head. The Galley also has the kinds of storage needed for a month or so between grocery stops as well as the things needed to make a galley work. The Port hallway is again a plethora of storage with 2 large hanging lockers, a tall chest of drawers and several 6 ft long shelves, Each of the 2 staterooms has a lot of shelves, drawers and compartments. Frankly there are few Catamarans under 45ft with equal accommodations for extended use by up to 4 adults. Our 34ft Catalac has far more useful storage space than any boat I have looked over of comparable size. On a hot day, there are 6 opening hatches in the ceilings, 8 side windows that tip in and can be left open in most rains and 2 large sliding windows on the side of the raised portion on each side of the salon. Compare that with any comparable sized Catamaran. With a beam a little over 15'. we are often able to fit in a power boat or monohull slip and not have to pay for oversize slips. gentleness) and it sails remarkable well for a loaded cruising cat. Most of the “fast” cruising cats are noted for not being fast when outfitted for cruising. If you want double digit cruising, you need a different boat. 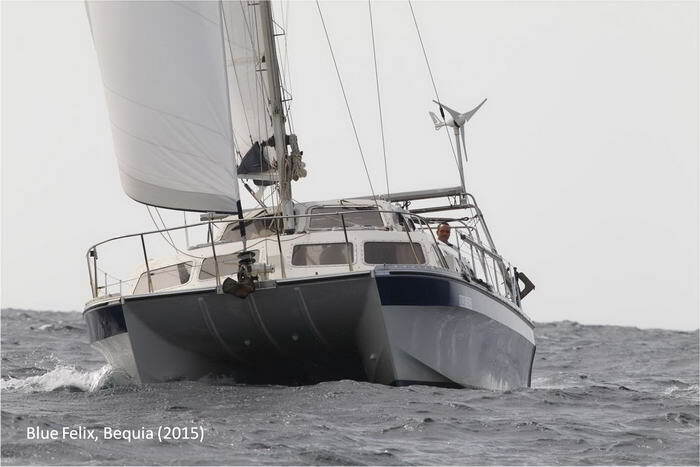 This is not a fast cat – under sail or under power. But I am pretty happy with a lazy cup of coffee and a lazy sail with little need for constant attention letting the autopilot do the steering. This boat is a great lazy sailing ship with very nearly a house boat's accommodation. 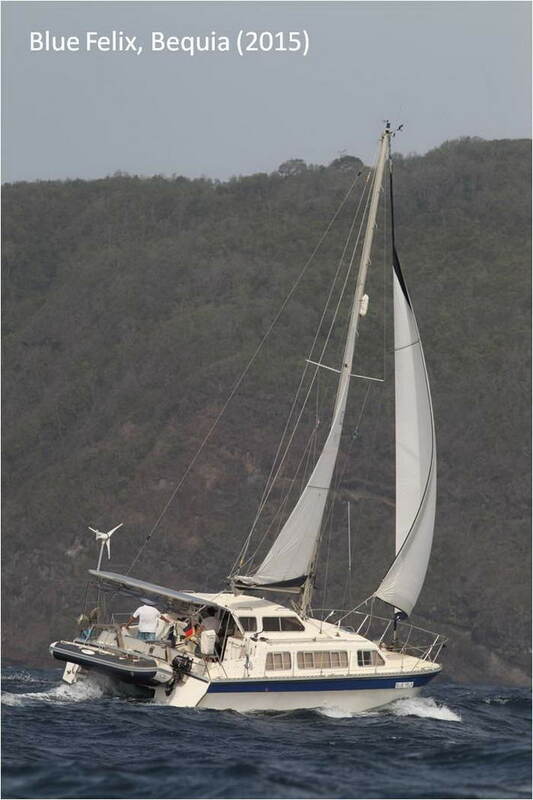 She tacks well without needing any tricks like back winding the headsail and maintains a nice 5+ knots under modest breezes. And as any sailor can tell you, where you want to go is often not where the wind wants to help much... so, how she powers is also important. We have found Serendipity loaded with full water and fuel tanks, lots of tools, heavy ground handling and plenty of provisions for several weeks motors along very quietly at around 6 knots on the GPS on one engine at about 2400RPM burning well under 1 gal an hour.. Applying more power adds a little speed at the cost of sharply increasing noise and fuel consumption.